I’ve always felt a little bit guilty about eating chocolate in the morning. It was a forbidden food for so long and I just can’t seem to get that out of my head. But this is not chocolate. Well, technically it is, but’s it’s cacao so somehow it’s transformed with magical powers to be eaten at anytime of day or night. 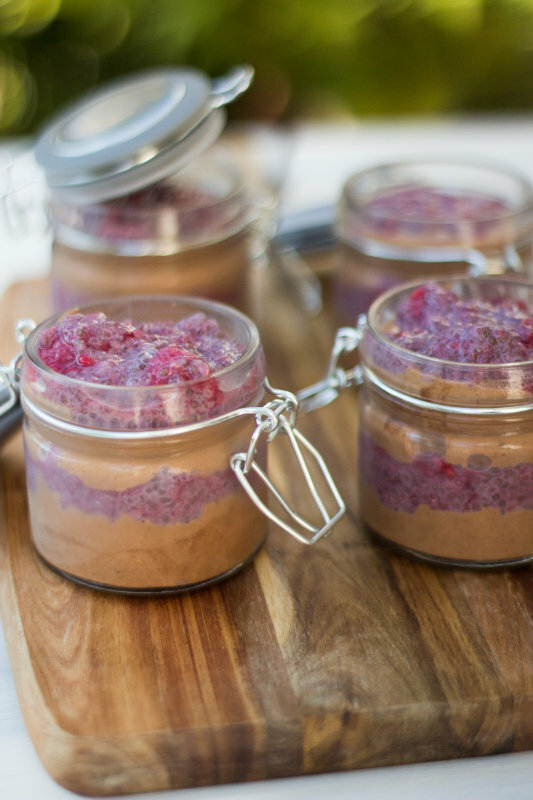 And teamed with raspberries and chia, these raspberry cacao power pots are jam-packed with power. Adding the maqui powder is optional but it gives the pots a glorious colour and a dreamy taste. Maqui berries are grown in Chile and have a deep purple colour. They are jam-packed full of anti-oxidants. Did you know your body makes anti-oxidants? But they are so busy fighting off all the nasties that it’s worth helping them out every now and then with a power pack of nutrients. Be prepared to wait for this snack. As the saying goes, good things come to those that wait. I think you could find a saying for anything that you wanted to prove. But anyway, it works here so I’m using it. You need to be prepared to wait. My suggestion is make it at night. Go to bed. Have beautiful sweet dreams about it and then wake up and eat it. Yes, for breakfast! 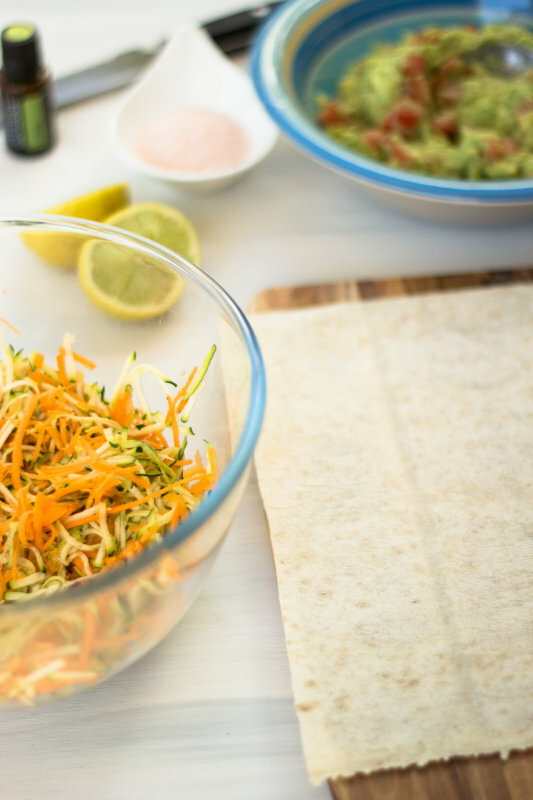 The minimum time to have this setting in the fridge is one hour, but two or three is even better and overnight is the ultimate. 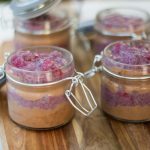 The raspberry and chia will set fairly quickly, but the longer you can leave the cacao, dates and banana mixture the better it is going to look in the jars when you serve it. Add some banana or coconut or if you wish to be truly decadent add some cacao nibs. Cacao nibs are pieces of cacao beans that have been roasted and hulled. You can buy raw, organic cacao here. Place chia seeds, almond milk and maqui in a bowl and stir until combined. Soak the pitted dates for 15 minutes. Add the dates to a food processor and blend until smooth. 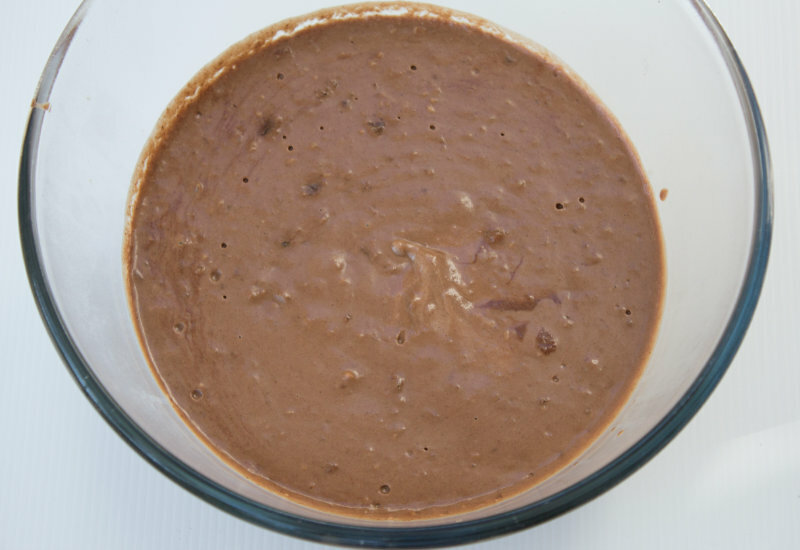 Add cacao, bananas, peanut butter and milk and continue blending until all ingredients are mixed together. Place in the fridge to set for at least 1 hour. Remove the raspberry mixture and the chocolate mixture from the fridge. Place a layer of the chocolate mixture into 6 small glasses being careful not to touch the sides of the glass. Top with the raspberry mixture. 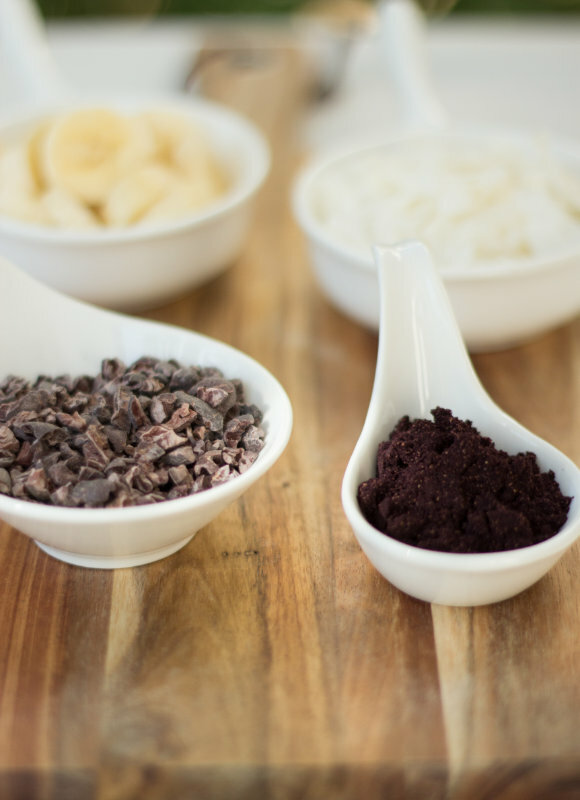 Repeat and then top with coconut, cacao nibs or extra banana.